Here is our last coloring page for the day. 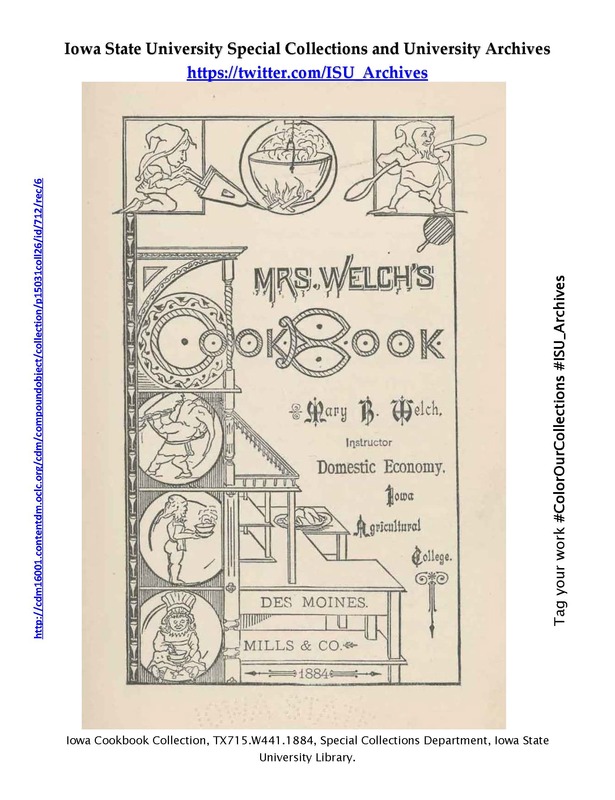 It’s from Mrs. Welch’s Cook Book. Click here to download & print this page. 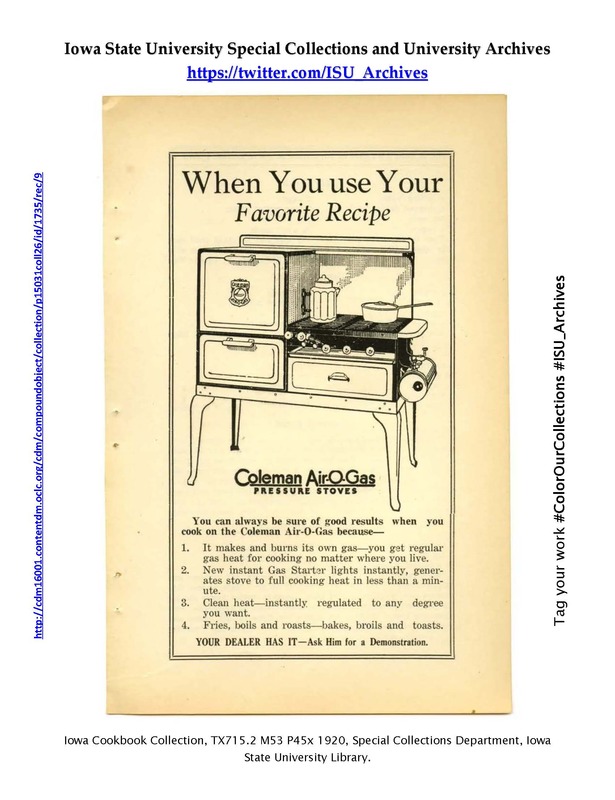 This week-long foray into the coloring craze was initiated by the New York Academy of Medicine Library. 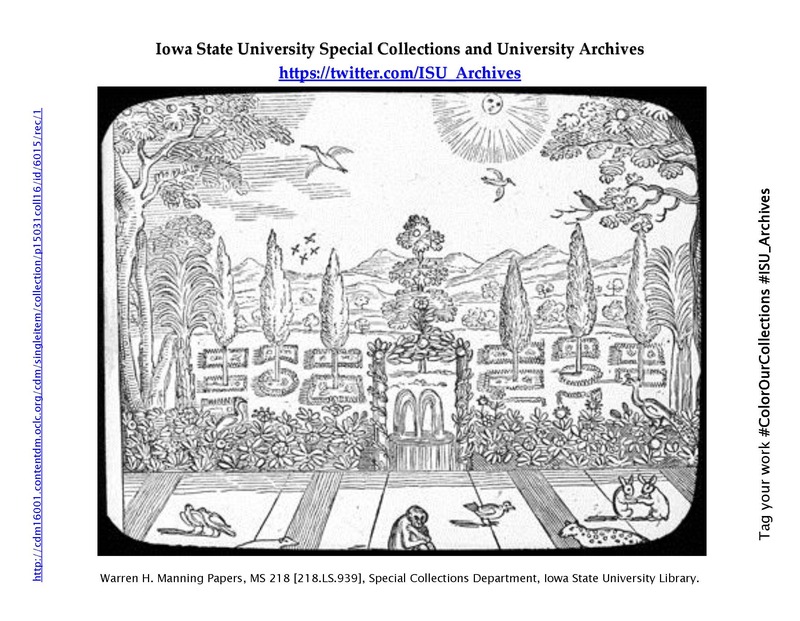 We are participating in this week-long special collections coloring fest to promote our collections anad engage followers. Check out the 70+ other repositories joining in on the fun! Here is our second coloring page of the day. It’s from the Bomb, The Iowa Agricultural College/Iowa State University yearbook. 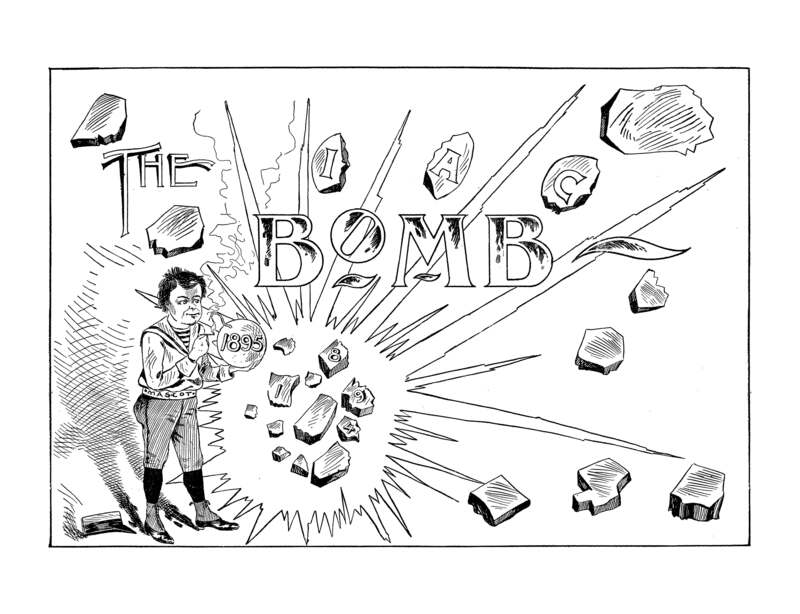 The Bomb was published annually for the graduating classes of 1894 through 1994, with the exception of 1902. Stop by our reading room and browse all volumes, we’re open Monday-Friday from 10 -4. 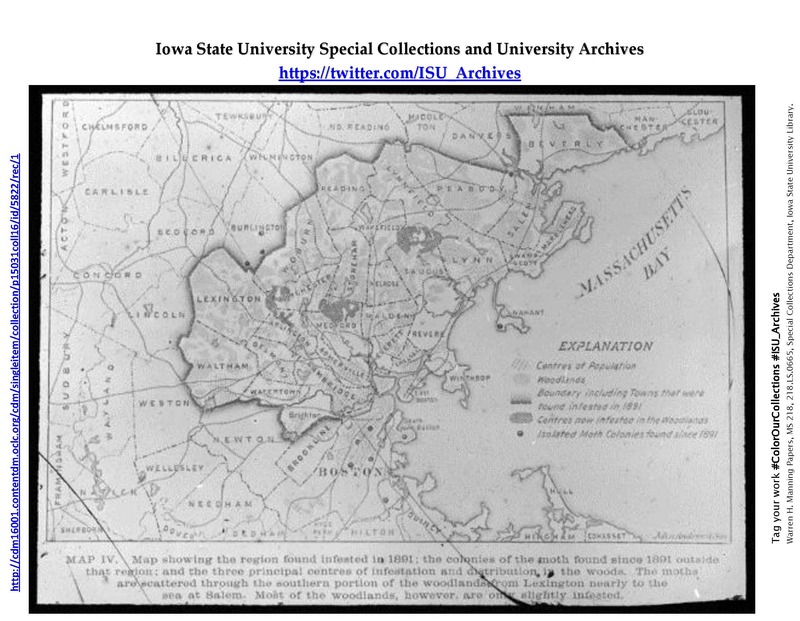 You can also click here to browse selected volumes online. Click here to download & print the coloring page. Good morning! Today’s coloring pages come from our rare books collection. First up is a page from Otto Brunfel’s Herbal from 1532. Brunfel was one of the three “founders of botany.” Many early herbals were printed with engravings that were meant to be hand-colored later. Now you can be an herbal illustrator! Otto Brunfel’s Herberum vivae eicones. Call number: QK41 .B835h. 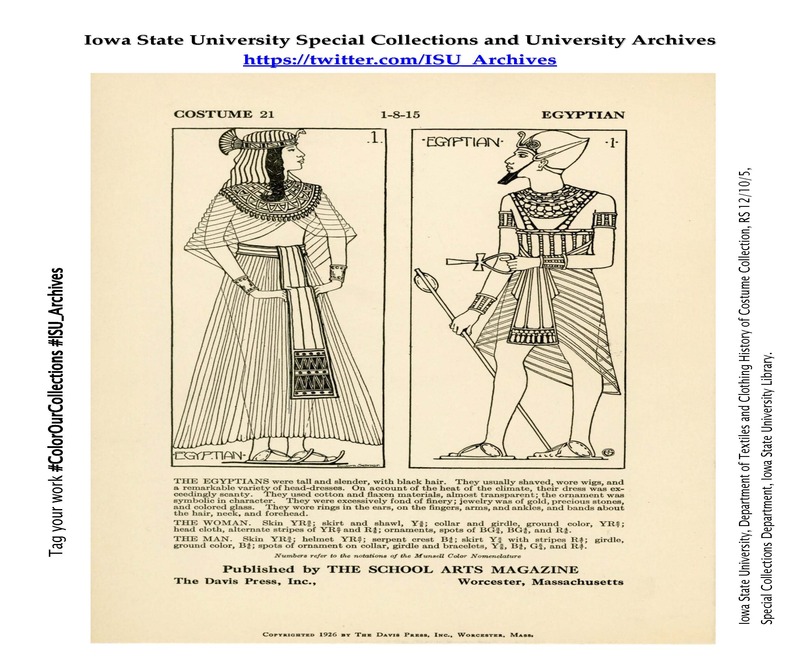 Here’s the last coloring page for Tuesday, a reproduction from the Iowa State University Department of Textiles and Clothing History of Costume Collection. RS 12/10/5, Special Collections Department, Iowa State University Library. Click here to download the page so you can print it out & color away! Click here to download the page. Or drop by the reading room and browse some cookbooks in person! We’re open Monday-Friday 10-4! Color this page while you have your morning cup of coffee! What better way to start your day in a nice relaxing way! Map showing infestation of gypsy moth ca. 1891. Join in on the coloring craze! Here is our first coloring page, a reproduction from the Warren H. Manning Papers! Line art conception of Andreini’s Paradise in the poem L’Adamo [Illustration from the 17th century] from the Warren H. Manning Papers (MS 218). Download the coloring page on the link below & color away! 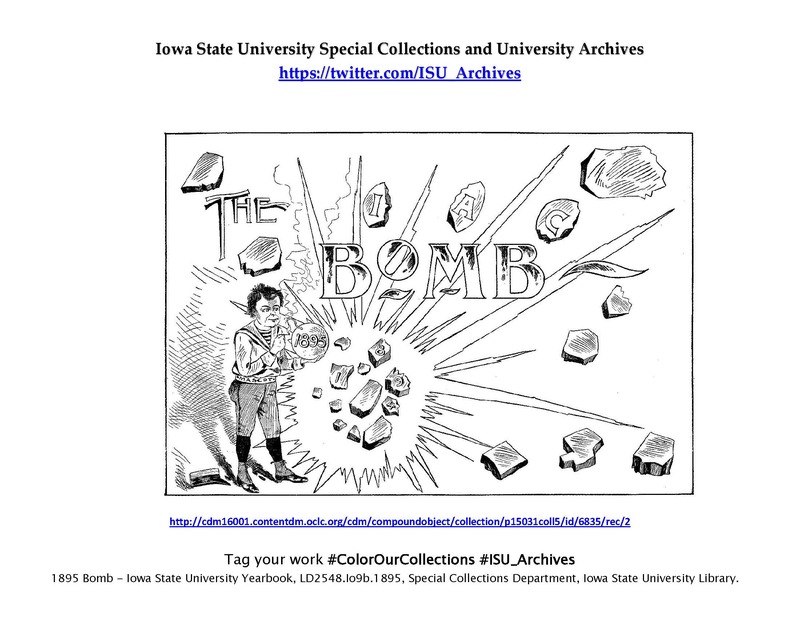 From February 1-5, Iowa State University Special Collections and University Archives is sharing reproductions of images from our collections and inviting followers to share their colored copies. Title page for the 1895 Bomb, the yearbook for the Iowa State College (University).